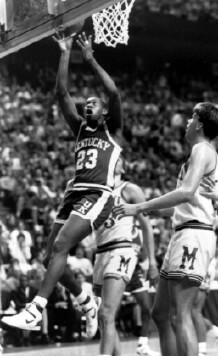 Eric Manuel was a despicable athlete who cheated on his entrance exams in order to gain admission to the University of Kentucky so he could play basketball. He obviously cheated because his answers were almost identical to another student in the classroom. Therefore, Manuel alone deserved to be banished for life. Eric Manuel was a top high school recruit from Macon Georgia in the 87-88 class. At 6-6, he had the frame of a forward but the skills of a guard. He failed his ACT tests a number of times in his quest for freshman eligibility, the second to last attempt securing a 14 (by Thomas Stinson, Atlanta Constitution Journal, February 5, 1989.) On his final attempt, Manuel took the test at Lexington Lafayette high school and attained a 23, making him eligible. Manuel played a low key but important role for Kentucky as a freshman. Before his sophomore season, however, allegations came to light questioning his score. The NCAA as part of their probe of Kentucky, noticed that Manuel's answers were almost identical to another student's answers (211 of 219 answers) who took the test at the same time. They attempted to intimidate Manuel into a confession, although he repeatedly denied cheating. One investigator, Bob Shrout, even went so far as to stand in front of Manuel's house and yelling at his mother, calling her a liar and shouting that 'Eric will pay for this' and that 'Eric will be the one to suffer.' Manuel stood by his claim of innocence. Southwest coach Don Richardson pleaded with him to come clean "I told him, 'Don't protect anybody, because now, Eric, you've got to survive . . .'" - Lexington Herald Leader June 11, 1989, pg A1. But still Manuel claimed innocence. When the NCAA sanctions came down on Kentucky, they made good on their promise. Manuel was barred from NCAA competition. He left UK, spending a short time at Hiwassee College (Tennessee) before ending up with Oklahoma City, a NAIA school. While there, Manuel was a key member of two NAIA national championship teams. There are two possibilities of what happened which seem much more plausible than what the NCAA determined. The first absolves Manuel from any involvement and implicates others close to the program. The second implicates Manuel himself but requires help from others. Both scenarios point out the poor job the NCAA did in finding the truth during its investigation. 1. It's entirely plausible that Manual had nothing to do with the cheating but someone else switched out the tests, filled out multiple answer sheets or changed answers after the forms were turned in. It is known that one of the proctors photocopied Manuel's answer sheet because she knew someone who wanted Manuel's autograph. ("Odd Man Out," Sports Illustrated, February 11, 1991, Vol 74, No. 5 pg. 170.) Beyond that, being a UK basketball player in Lexington makes one a minor celebrity so there must have been quite a few autographs around Lexington at the time. The NCAA, during their investigation, attempted to reconstruct the events that might have occurred between the time the tests were handed in on Saturday and when they were sent to Iowa City on Monday. Their efforts were not rewarded due to a lack of cooperation. Ed Dove suggested that Manuel had signed two answer sheets that day. One for the test he took and the second which was taken care of by someone else without Manuel's knowledge. "We know there were lots of people with an interest in him being eligible," says Mark Hammons, the Oklahoma City attorney who argued Manuel's court case pro bono. "UK and its boosters and affiliates -- they had much more to gain by altering his test score than Eric did." - "Odd Man Out," Sports Illustrated, February 11, 1991, Vol 74, No. 5 pg. 175. 2. The second scenario suggests that the student who Manuel was accused of cheating off of was actually working in concert with Manuel to defraud the process. This could have happened any number of ways, with perhaps the student working out signals for which answer to fill in, or the student's transferring test forms at times during the test in order to fill in Manuel's answer sheet. It may have been an idea concocted by the two themselves or it may have been orchestrated by an adult either close to or within the program. A number of years after the fact, the student, Chris Shearer (named in the book Raw Recruits but listed as anonymous by the Lexington Herald Leader), came out and claimed he thought Manuel copied the answers off of him. - Lexington Herald Leader, pg A1 March 18, 1992. Interestingly, the student went as far as saying that during the test, he looked at Manuel's answers and found similar answers. This type of information leads to some questions such as 1.) what was he doing looking at other people's tests during the ACT (and comparing answers) 2.) why didn't he come out with this information earlier and 3.) if he thought Manuel was cheating, why didn't he ask to be moved during the test or tell one of the proctors, all of whom said they didn't notice anything unusual during the test. This student was heard to be boasting at school after the test that he helped Manuel get into Kentucky (Raw Recruits, pg. 172) It certainly seems possible that Shearer, with his changing stories, was a little more involved in the events than it first seemed. Before this claim in 1992, Shearer was less than cooperative with the NCAA investigation. When Ed Dove, the public defender who took up Manuel's case, approached looking for information, Shearer's father told him, "You're not coming around my kid". (Odd Man Out," pg. 170) Again in 1991, Shearer refused to be interviewed for Alexander Wolff's article in Sports Illustrated. Interestingly, the NCAA thought that Eric was aided by others but could never find any accomplices. "Without his cooperation, there was no way to establish others who may have been involved," David Berst of the NCAA said. - Lexington Herald Leader, pg A1 June 11, 1989. Instead of admitting a lack of evidence, the NCAA went ahead and convicted Eric based on their gut feeling. Basically the NCAA predetermined what they thought happened, couldn't find any evidence to support it and then pronounced Manuel guilty anyway. Manuel didn't have any power against the NCAA and had no genuine way to appeal the decision. Manuel's legal defense was handicapped by a lack of money for any type of fact finding on their own. Handing down such a harsh decision had the look of a strong case by the NCAA but in reality it highlighted just how inept and unfair the NCAA is. It was clear to those familiar with college basketball that Manuel was being used as an example by the NCAA. (Atlanta Constitution Journal, March 6, 1990.) To add insult to injury, the NCAA charged Manuel with misleading and lying to investigators. "What I was saying was the truth," Manuel said. "I'm going to stand by that. They didn't have any real proof throughout the whole thing. They just said I just don't tell the truth. I never did anything wrong during the test." - by I.J. Rosenberg, Atlanta Journal and Constitution, March 6, 1990. The banishment from the NCAA did not end the struggle for Manuel. After accepting a scholarship from NAIA school Oklahoma City, the NAIA, completely basing its decision on the NCAA's report, tried to bar Manuel from playing for any of its 488 schools. "We don't have a vendetta against Eric Manuel." said NAIA official Wallace Schwartz. "We just don't think as an organization that the young man fits our definition of student-athlete." ("Odd Man Out," pg. 176.) Despite this lack of faith on the part of the administrators, Manuel was able to attain solid C-plus/B-minus grades at Hiwassee and Oklahoma City. He gained support among the people who took the time to get to know him. "People here are supportive of Eric," says Jerald Walker, the school's [Oklahoma City] president, "because he's a decent human being who studies hard." - "Odd Man Out," Sports Illustrated, February 11, 1991, Vol 74, No. 5 pg. 176. "If he was a bad kid or not trustworthy, you'd say it happened for a reason," [former Kentucky assistant coach Dwane] Casey says. "But Eric's a jewel. Coach [Eddie] Sutton is doing well. Chris [Mills] is doing well. And I can always do something else. But basketball is Eric's life. Anyone who won't give him a second chance just isn't being fair." - "Odd Man Out," Sports Illustrated, February 11, 1991, Vol 74, No. 5 pg. 168. "We see a side nobody else sees. Everybody else sees him in that fame and glory on the court. We see him struggle, we see him work hard and we see things that are difficult for him and ... he's a great kid." Bob Bradley, UK assistant athletic director for academic affairs. - Lexington Herald Leader, June 11, 1989. Rather than give in, Manuel continued to fight and appealed the NAIA decision in court. On October 26, 1990, he was finally given some measure of relief when the district court judge ruled that the NAIA was overextending its powers in the decision. After leading Oklahoma City to two championships, Manuel was picked up by the New Jersey Nets but was unable to secure a roster position. After playing a few years in European leagues, he returned to Oklahoma City in late 1993 where he began working a local Coca-Cola bottling plant as a sales merchandiser. He tried out off-and-on for overseas and CBA rosters but never made it pay off in a serious return to the game. Recently, I've been informed that he left Coca-Cola in 2000 and currently works for an electronics store. I'm not claiming that Kentucky was clean because I think it most likely was dirty. I'm glad now that Rick Pitino and now Tubby Smith seems to be running a very clean ship. I'm not ready to concede, however, to the NCAA when they investigate using techniques even law enforcement agencies can't use without a warrant and then hand down decisions without providing evidence or even plausible explanations of the events, not to mention not providing a realistic appeals process. This issue should continue to be discussed until some meaningful reforms are made to the NCAA itself. The questions concerning the power wielded by the NCAA and its accountability are important and must be addressed if collegiate athletics is to grow and succeed in the future. Return to Kentucky Wildcat Basketball Page.